My three-year-old granddaughter loves fish cake and can eat it every day and for every meal. Which makes me wonder about the fish cakes we buy from the market. Maybe I should make my own, as my mother did? Then I would know what exactly goes into it, no monosodium glutamate (MSG) and no bad additives, just plain fish, freshly sliced, bought that morning. All well and good, except that I have a fussy eater on my hands, for whom texture, appearance and, of course, taste, matter. Can I get the same springy texture? Can I approximate the same taste if I cut out the MSG? With all these considerations, can I get her to eat it? With such questions whirling in my head, I proceeded to make fish cakes for the little one. Fish cake can be found in most cultures, maybe not the bouncy ones that we love, but a patty, often made with potato, and seasoned in various ways. The most common way in Asia is to add a sprinkling of chilli powder to the mix. The Thais do it, together with chopped long beans for crunch, and the Indians do it too, adding potato to bulk up. In fact, many cultures add potato to fish cakes or fish cutlets. It adds substance without the need for more fish. The trouble is that potato interferes with the texture and the fish cake becomes soft and mushy. Since I am feeding a fussy toddler, the fish cake has to be plain and familiar, so certainly no chilli, unusual seasonings, vegetables or potato in the mix. To get that familiar springy fish cake is easier than you think. Our mothers used to throw the mixture several times against the side of the mixing bowl, but we can get the same result with a food processor. Just process it further to make it bouncier. You can do the same with meat mixtures too, to get bouncy beef balls, for example. For the fish, I like meaty fish like batang or snapper as they are sweet and easy to debone. Both fish are also easy to skin and you do not have to cope with bits of skin muddying up the mix. After a spin in the food processor, you fashion the mix into cakes - the size is up to you - and then lightly pan-fry it to make it sturdier and to obtain a tasty skin. I make plain fish cakes, unadorned, for the little one. I then serve the rest of the fish cakes with a pile of fresh herbs and salad leaves and with a chilli dip, topped with nuts, for adults. •Remove skin and bones from the fish slices. Pull out tiny bones with a pair of tweezers. •Slice the fish into smaller pieces and place in the bowl of a food processor. •Season with salt and sugar. Add an egg to bind. Add the shallots. •Process till the mixture pulls away from the sides. Fashion into cakes. •Heat 1tbsp of vegetable oil in a pan and fry the fish cakes over medium heat, turning over till browned. Remove and drain on kitchen paper. •Mix ingredients for sauce together and adjust seasoning. Add chopped nuts before serving. 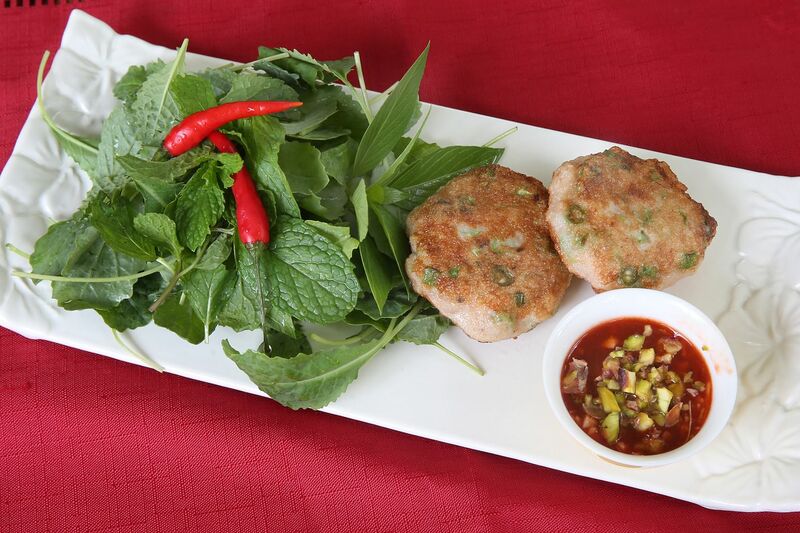 •To serve, place fish cakes on a plate, add salad leaves and fresh herbs and have a saucer of chilli sauce with nuts on the side.